All the King's Men (1949) is the fictionalized account of the rise and fall of a backwoods rebel - a story inspired by the rule (and abuse of power) of Louisiana's colorful state governor (1928-32) and Democratic U.S. Senator (1932-35), notorious Huey Pierce Long - "The Kingfish." It is a melodramatic story of the corruption of power by an ambitious demagogue, adapted and based on the Pulitzer Prize-winning and best-selling 1946 novel of the same name by Robert Penn Warren, and filmed from a script by producer/screenwriter/director Robert Rossen (known for directing other films such as Body and Soul (1947) and The Hustler (1961)). "He thought he had the world by the tail...till it exploded in his face...with a bullet attached..."
The great political film was a breakthrough film for Broderick Crawford from his B picture status - his performance is very compelling and impressive as he is transformed from a backwoods, honest and naive lawyer into a dirty, unscrupulous and sleazy politician. Of the film's seven Academy Awards nominations, it won three major honors: Crawford won the Best Actor statuette, Rossen (as producer) won the Best Picture Oscar, and Best Supporting Actress went to Mercedes McCambridge (in her screen debut). 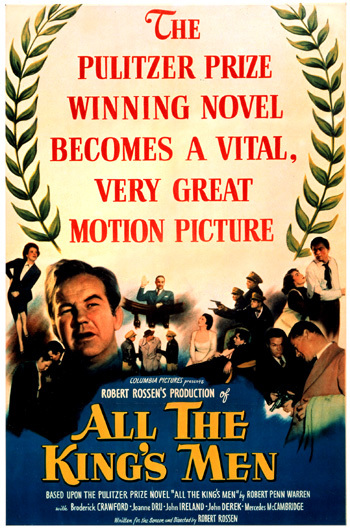 Its other nominations were: Best Supporting Actor (John Ireland), Best Director and Best Screenplay (both for Rossen), and Best Film Editing. Writer/director Steven Zaillian remade the film 57 years later, as All the King's Men (2006), with mixed reviews. It starred Sean Penn as Willie Stark (Broderick's role), Jude Law as Jack Burden (Ireland's role), Kate Winslet as Anne Stanton (Joanne Dru's role), Mark Ruffalo as Adam Stanton (Shepperd Strudwick's role), and Patricia Clarkson as Sadie Burke (McCambridge's role). Reportedly, Zaillian never saw the original film, and adapted the screenplay solely from Robert Penn Warren's novel. Stark is pressured to break up his assembly due to an ordinance selectively enforced by the local authorities to deliberately disrupt the proceedings and prevent the passing out of handbills, but after a quick arrest due to his resistance, he is released by fat city boss Mr. Tiny Duffy (Ralph Dumke). Burden drives out with Stark to his rural home, where he meets Willie's long-suffering schoolteacher-wife (of nine years) Lucy (Anne Seymour), his father (H. C. Miller), and their sullen fifteen year-old step-son Tom (John Derek). While Willie aggressively eats his chicken dinner with a single-minded appetite, he is determined to run and stay in the race ("get(s) the truth to the people" according to his wife), no matter how much humiliation and harrassment he receives. With folksy charm, he vows: "I'm gonna run. They're not gonna kick me around like I was dirt." When adopted son Tom returns home, he describes how Duffy's goons were waiting for him, and threw away his stepfather's handbills. Willie again swears: "I'm gonna run even if I don't get a single vote." One gets a very definite impression that Willie Stark will not bow to the past, but will make a new future. It might conceivably happen that in his future, also lies the welfare of the people of this State. "I'm gonna run," he shouted, "and you're not gonna stop me. I'm gonna run even if I don't get a single vote." As I watched him shake his big fist and listened to his words boom out across that field, I had the feeling that here was a man with a will of iron. I had the feeling that Willie Stark would neither be steered away nor scared away from his purpose. I had the feeling that in Willie Stark, Kanoma County had found that rare thing: an honest man with courage. After producing the sympathetic article that befriends Stark, Burden takes a well-deserved two or three-week vacation in his childhood home community of Burden's Landing (named for his ancestors), about 130 miles from Kanoma City. In Burden's voice-over as he crosses over to the small, peaceful and isolated island town, he muses: "It was separated from the mainland by a body of water. For the first time, I wondered if it wasn't separated by more than that." Jack greets his Southern society mother (Katherine Warren), but is coldly distant from his stepfather Floyd McEvoy (Grandon Rhodes). A respected and distinguished inhabitant of the island community is patriarchal Judge Montgomery (Monty) Stanton (Raymond Greenleaf). Stanton's socialite niece is Anne Stanton (Joanne Dru) [mis-spelled as Ann in a newspaper article], Burden's girlfriend, and Stanton's nephew (brother to Ann) is noted physician Dr. Adam Stanton (Shepperd Strudwick) - a close childhood friend of Jack's. Jack (sarcastically turning toward the portrait): Like your father? All right, I'll run for governor. Anne, I'm sorry, I'm sorry I said that. Burden cuts his vacation short and returns to the newspaper. Although honorable and truthful and considered a "log cabin Abe Lincoln," Willie's efforts are hopeless against the state's "dishonest" political machine, and he loses the County Treasurer election ("I guess that's the end of Willie Stark," Burden mutters). After the loss, Willie studies law at home under the patient tutelage of his educated wife to become a hick lawyer. In a montage - Willie proudly hangs up his framed Bachelor of Law diploma from Kenport Law School, accepts indigent cases in his new law practice, and works long hours behind his storefront window (decorated with bold letters WILLIE STARK, ATTORNEY AT LAW). Kanoma's recent school tragedy serves as a potent reminder that a man named Willie Stark, a citizen of Kanoma City and defeated candidate for County Treasurer, fought bitterly against the awarding of our schoolhouse contract. His was "the voice in the wilderness" that fell on deaf ears, and the children of Kanoma City paid the price. Nothing can ease the pain in the brave hearts of our bereaved parents who suffered their loss bravely. SCHOOL VICTIMS SUE COUNTY; STARK FILES DAMAGE SUIT - 'Will Prove Graft Cause of Tragedy' Says Atty. Stark. Sadie: I wish the poor --- had enough sense to have somebody give him a good reason for the beating he's going to get. 'Cause this way, all he gets out of it is the ride. Hey, those speeches, ain't they awful? Ain't they just plain awful? Question to you: If somebody told him he was a sucker, do you think he'd quit? Willie senses that Burden is right, and that he won't be governor: "A man don't have to be governor...I'm gonna lose, Mr. Burden, I know that. Don't try and fool me...I would have made a good governor, better than those other fellas." After learning that he was used, Willie promptly proceeds to get drunk from a bottle of bourbon and then passes out. The next morning, still recovering from a hangover and half-conscious, he is led to the Upton Fairgrounds for a campaign barbecue and speech. A ferris wheel spinning in the background reflects the spinning within Willie's head. To recover before he is due to give his canned talk, Willie sits in a playground swing where other children are playing, and drinks down coffee (and a generous amount of bourbon). Sadie: How'd you get him here? He was out stiff. Jack: The hair of the dog that bit him. Sadie: Hair? He must have swallowed the dog. My friends. I have a speech here. It's a speech about what this state needs. There's no need in my telling you what this state needs. You are the state and you know what you need. You over there, look at your pants. Have they got holes in the knees? Listen to your stomach. Did you ever hear it rumble for hunger? And you, what about your crops? Did they ever rot in the field because the road was so bad you couldn't get 'em to market? And you, what about your kids? Are they growing up ignorant as dirt, ignorant as you 'cause there's no school for 'em? No, I'm not gonna read you any speech. (He casts his speech away behind him.) But I am gonna tell you a story. It's a funny story so get ready to laugh....Get ready to bust your sides laughin', 'cause it's sure a funny story. It's about a hick. A hick like you, if you please. Yeah, like you. He grew up on the dirt roads and the gully washes of a farm. He knew what it was to get up before dawn and get feed and slop and milk before breakfast, and then set out before sunup and walk six miles to a one-room, slab-sided schoolhouse. Aw, this hick knew what it was to be a hick, all right. He figured if he was gonna get anything done, well, he had to do it himself. So he sat up nights and studied books. He studied law, because he thought he might be able to change things some - for himself and for folks like him. Now I'm not gonna lie to ya. He didn't start off thinkin' about the hicks and all the wonderful things he was gonna do for 'em. Naw, naw, he's done it all thinkin' of number one. But something came to him on the way. How he could do nothin' for himself without the help of the people. That's what came to him. And it also came to him with the powerful force of God's own lightning back in his own county when the school building collapsed 'cause it was built of politics' rotten brick. It killed and mangled a dozen kids. But you know that story. The people were his friends because he'd fought that rotten brick. And some of the politicians down in the city, they knew that, so they rode up to his house in a big, fine, shiny car and said as how they wanted him to run for governor...And he swallowed it. He looked in his heart and he thought, in all humility, how he'd like to try and change things. He was just a country boy who thought that even the plainest, poorest man can be governor if his fellow citizens find that he's got the stuff for the job. All those fellows in the striped pants, they saw that hick and they took him in...Now, listen to me, you hicks. Yeah, you're hicks too, and they fooled you a thousand times, just like they fooled me. But this time, I'm gonna fool somebody. I'm gonna stay in this race. I'm on my own and I'm out for blood. Now listen to me, you hicks! Listen to me, and lift up your eyes and look at God's blessed and unfly-blown truth. And this is the truth. You're a hick, and nobody ever helped a hick but a hick himself!...I'm the hick they were gonna use to split the hick vote. Well, I'm standin' here now on my hind legs. Even a dog can learn to do that. Are you standin' on your hind legs? Have you learned to do that much yet? His campaign literally catches fire. A headline from the newspaper: "STARK CHANGES BOOMING!" reflects the strong resurgence of voter interest in Willie as a viable candidate in rural areas. Fearful of his growing power and that Stark "is getting too big for his britches," city bosses order strong-armed retaliation and bribery against the leader of the hicks. When Burden's editor demands that the Chronicle support Stark's opponent Harrison, the politico's man, the principled reporter quits his job. Although Stark loses the election to Harrison in a close race, Stark sweeps rural areas. The city vote decides the election, and a record number of votes are polled. Confident that he has touched a nerve with the people and will win the gubernatorial race the next time around ("I learned something...how to win"), Willie is joined at a bar for drinks by Sadie, Burden, and stuttering henchman Sugar Boy (Walter Burke) - a bodyguard and assistant who previously worked for his opponent Tiny Duffy. Burden (a "college man") joins Stark's entourage and team as chief aide, hatchet man and speech writer. Surprisingly, Willie surrounds himself with his previous opponents, including Tiny Duffy. He also hires shrewd Sadie Burke as his secretary and campaign manager, after she switches allegiances from the political machine. Willie confidently brags about his disregard for financial resources and his wheeling-dealing: "Money, I don't need money. People give me things...because they believe in me." Do you know what good comes out of?...Out of bad. That's what good comes out of. Because you can't make it out of anything else. You didn't know that, did you? He believes that any worthwhile programs (such as schools, highways, hospitals) require some degree of corruption, deal-making and dirty power politics. He solicits the community's support: "There's a time to talk and there's a time to act. I think the time to act is right now, and with your support, I not only will win, but I will do all of the things I promise. I need your help - oh, I need it badly, but I'm not gonna beg for it. In the name of this state, which we love, in the name of the governor in whose house we meet, I demand it." Afterwards, when he has been reassured of their support, he craftily promises that the Judge will be made his Attorney General. Anne displays her admiration for the dynamic candidate.